hot water | J.J. McLellan & Son "
Waking up this morning… the Thursday before Good Friday and seeing a blanket of snow on the ground – just isn’t cool! Apparently its still heating season so make sure before you leave this morning your heat is on for when you get home this evening! Save a few dollars on your heating bill by lowering your thermostat just slightly when you aren’t home – even better if you have a programmable thermostat you can program it to lower during the day and increase a degree or two just before you get home! 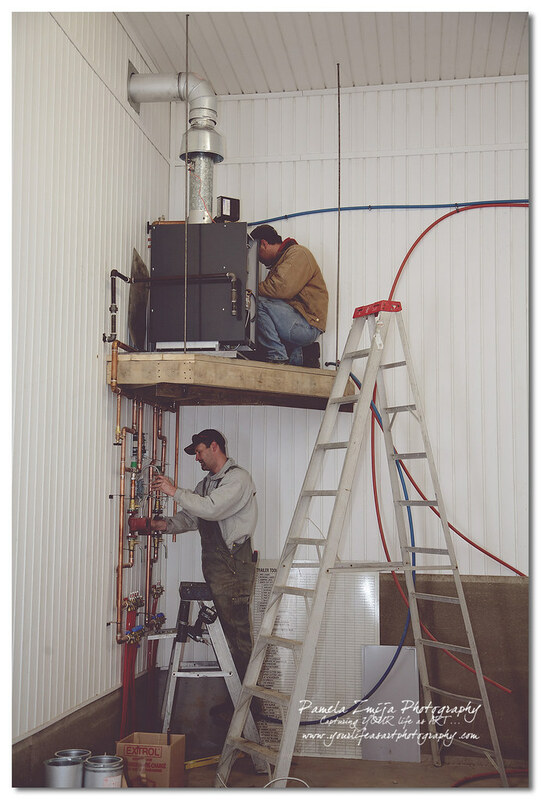 Stay warm… this photo above is two of our gas technicians working on a boiler system with in floor heating. Remember tomorrow is Earth Day! Have you noticed your showers aren’t lasting as long or by the end of the night and the kids are all bathed and in bed… you go to enjoy a nice warm and relaxing shower to find that there is no hot water! Do you know how old your hot water heater is ? Or when the last time it was serviced? A properly maintained and serviced Hot Water Heater will provide you with much more available hot water than a poorly maintained and not-serviced Hot Water Heater. One way you as a home owner can save money is by properly maintaining your hot water heater… and another is renting your hot water heater. By renting your hot water heater you simply pay a low monthly rental fee which covers any repairs which may have to be done to the hot water heater – reducing your out of pocket expenses! Another way to save is with a Natural Gas Tankless Hot Water Heater! Give us a call or drop us an email and we can discuss your Hot Water Needs and provide a FREE Estimate! Natural gas water heaters offer two distinct choices in style (storage tank and tankless) and three choices for venting (conventional, direct vent, power vent). Additionally, you may be able to combine your water heating with home heating. A storage tank water heater is the most common type of water heater in Canada. It consists of a gas burner and a steel cylinder storage tank with capacities ranging from 30 to 100 gallons (113 to 378 Litres). Cold water is drawn into the bottom of the tank where it is quickly heated by a gas burner. Hot water rises to the top of the tank. As the hot water is used, it is replaced at the bottom with cold water. The tank thermostat controls the water temperature in the tank both when it is leaving the tank to your taps and when it is on “stand by”, waiting in the tank to be used. The more efficient a water heater is the less heat is lost when the unit is on “stand by”. A tankless water heater has no tank and stores no hot water. When hot water is needed, the water is heated on demand. When the hot water tap is turned on it triggers a flow switch that activates the burner which heats the cold water entering the tankless water heater. The water is rapidly heated to the desired temperature. This continues for as long as the hot water tap remains in the ‘on’ position. When the tap is turned ‘off’ the system shuts down resulting in substantial energy savings over units that have hot water stored in the tank on ‘stand-by’. A tankless water heater can save space and offer flexibility being able to be installed close to the point of use. FACT – Neither a direct vented nor a conventional vent water heater requires electricity. If there is a power outage you will still have hot water. A power vent water heater does not need a chimney, but uses an electrically powered fan to move combustion products outside.